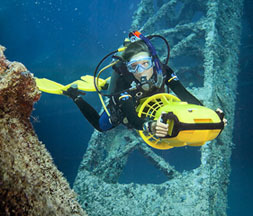 Diver Propulsion Vehicles (DPVs) offer a great way for scuba divers to see a lot of underwater territory in a short amount of time. They scoot you through the water allowing you to glide over reefs, buzz around a large wreck or weave through a kelp forest. Whether making a shore or boat dive, a DPV is a great way to see more and have fun doing it. The course consists of two dives. If you have done the DPV dive as part of the Adventures in Diving program that dive may count as the first dive of this course.